"How delightful were these groves scented with lilacs, peopled by nightingales . . . the queen spent most of the fine season there." In, Rainy Morning with a Master, I told you about a sweltering summer day in 1978, when a frazzled librarian gave a biography about Marie Antoinette to an inquisitive, loquacious child. 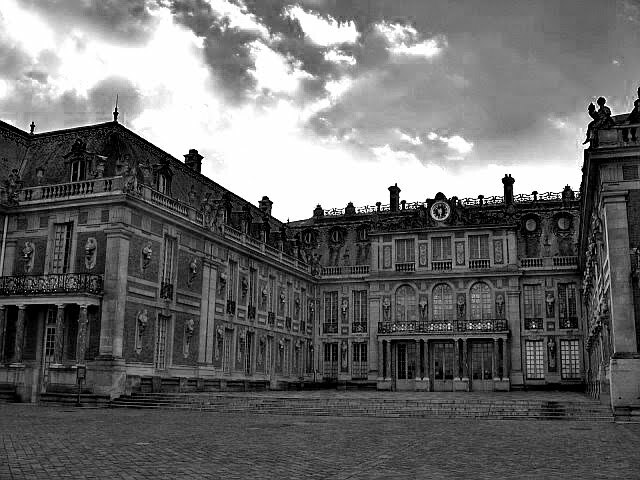 From that day on, I became obsessed with the tragic queen and with the notion of visiting the Chateau de Versailles. I imagined myself gliding through the Hall of Mirrors, sunning myself on the green grasses of Le Hameau, inhaling the earthy scents that permeate the air in the Orangerie. Twenty-two years later, my dream of visiting Versailles came true. Was it magical? Did I feel exhuberant? Not exactly. The moment I walked into the chateau I felt an overwhelming sadness, as if I had donned a mantle of meloncholy. 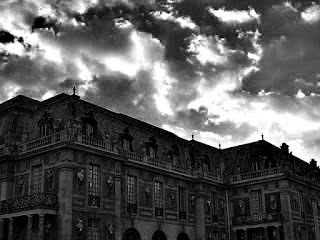 The gloom persisted through the King and Queen's Grand Apartments, the Hall of Mirrors, the baroque Chapel. Instead of taking my time to absorb the surroundings I had long desired to view, I felt eager to be done with it - as if some gloomy, ghostly force was propelling me through the palace. By the time I d boarded the tram to the Petit Trianon, I was blue and anxious. The journey, which lasted approximately five minutes, took me through landscaped yards and avenues of green. I got off the tram and entered Petit Trianon, the one-time private pleasure palace of my idol Marie Antoinette. I noticed I felt less sad still a little anxious. I wandered through the private realm of Marie Antoinette for an hour, touring the receiving room, where Marie Antoinette entertained her guests by playing the harp. I toured her private bedroom, saw her commode, and even ran my hands over the plaster relief of her interlocking initials. For a Marie Antoinette enthusiast, it should have been an overwhelmingly heady experience. And yet, I was underwhelmed. I felt Marie Antoinette's spirit in the building, but it was distant and muted. As if looking at someone through the wrong end of a telescope. I left the Petit Trianon and headed up the path towards the Temple of Love. With each step, I felt a bit lighter. The sadness was lifting. I came to a fork in the road and decided to veer to the left, away from the Temple of Love. A copse of trees stood to the right. I could see there was a slightly hidden path through the heart of the copse. I decided to follow it. Only the sound of leaves rustling in the breeze could be heard. It was a peaceful, restorative hike. I eventually came to a pond. Reflected in its surface was an octagonal marble building. Even distorted by the pond's rippled surface, it was a beautiful structure. I knew, without looking at my map, I had stumbled upon the Belvedere Pavilion. The Belvedere Pavilion, erected on a rock above the pond, was a place for Marie Antoinette to engage in relaxing pursuits. On warm days, she would throw open the many French doors and allow the breeze to flow through. It was easy for me to imagine her reclining on an upholstered chaise, listening to Princess Lamballe recite stirring, romantic poetry. On cool days, Marie Antoinette would serve tea to friends at the Belvedere. They would sit and stare out the doors, which acted as frames for the colorful splashes of nature beyond. It is at the Pavilion, that I felt the happiest. 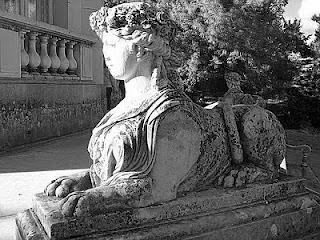 I climbed the steps and placed my hand on the head of one of the lioness statues that flank the Belvedere. The statue was cool, despite the warmth of the day. I walked to one of the French doors and noticed the tiny brass doorknob, weathered and worn. 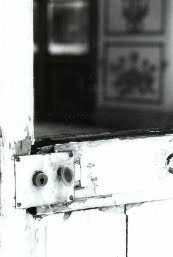 The white paint around the doorknob was bubbled and cracked, some pieces had fallen off leaving the wood bare and exposed. I found myself drawn to the simple doorknob. I couldn't resist wrapping my fingers around the knob. The brass was smooth and cool against my palm. I was struck by the thought, "Marie Antoinette might have touched this very knob." A delightful shiver ran up my spine. I looked in the window and noticed the understated elegance of the inner-chamber. The walls were paneled white and painted with gold leaf. The floor was an intricate design of colored marble. Even though the furniture was missing, the room did not feel empty. Strong shafts of sunlight streamed in through the doors and filled the chamber with glorious, golden light. Shadows, made by the trees, danced gracefully across the floor. I wondered if Marie Antoinette watched the dancing tree shadows? I wondered, too, if she appreciated the intrinsic beauty of the spot? I have read, on certain Sundays, Marie Antoinette would entertain her children at the Belvedere. Perhaps she sat on the marble steps, leaning her back against a lioness, and watched as the dauphin skipped rocks into her pond. I remained very still and thought I could almost hear the soft, lilting laughter of her daughter, Madame Royale . Marie Antoinette hosted magnificent night parties at the Petit Trianon. The grounds would be illuminated with lamps tucked in bushes and hung from trees. It took little effort to picture the Belvedere, ablaze with torches, as the setting of a charming night festival. The sky would have been black and smooth, not a cloud to be seen. The stars would have twinkled above, contrasting the inky darkness like diamonds tossed on ebony velvet. In The Private Realm of Marie Antoinette the author suggests Marie Antoinette's night parties may have been inspired by the paintings of Watteau. I found the theory very plausible. Watteau , a master of mood and atmosphere, had the ability to simplify the confusion of nature. Orange leaves, brown branches, green grass, blue skies. In Watteau's hands, the garishness of nature was transformed to subtle shifts of light and dabs of blended color. Marie Antoinette's pavilion is very Watteau-esque. Nature is harnessed by the simple building and pared-down setting. Attending a night festival at the Belvedere must have been a surreal experience, stirring and yet soothing. The queen enjoyed rehearsing plays, hosting musicals, playing on see-saws, betting on games of chance, playing blind man's bluff. Innocent diversions to keep her mind from dwelling on the turbulent nature of French society and politics. Once, when the Austrian Ambassador advised her against keeping such a frantic schedule, she sadly responded, "I am terrified of being bored." Boredom. It would aid in her undoing. Her impulsive pursuit of pleasure created a lethal short-sightedness. She failed to grasp the ramifications of her actions. Although her spending was far less than that of Madame de Pompadour , Louis XV's mistress, it was still great enough to raise the ire of the French. Night festivals, splendid ball gowns, a charming little hamlet - the expenses were grudgingly noted by many. Unbeknownst to her, Marie Antoinette came to Versailles dragging a rope behind her. The French were not fond of foreign-born queens - especially ones of Austrian descent. Building the Belvedere added just one more knot in the noose that would hang her. And yet, I adore the Belvedere. I love the gentle slope of the lawn, the ripples in the pond, the coolness of the marble. I love the way it stands upon a rock, higher than the Petit Trianon, as if announcing it's autonomy. For me, the Belvedere offered a brief but welcomed respite from oppressive emotions. My odd melancholy evaporated when I took the doorknob in my hand, but returned as soon as I descended the steps of the Belvedere. I am a romantic, it is true. I am ruled by emotions far more than logic. That being said, I have always looked skeptically at people who have claimed to have been visited by ghosts. I figured, since I had never had a paranormal experience neither had they. My visit to Versailles and the Belvedere altered my opinions about the paranormal. I am not claiming to have seen the Ghosts of Versailles, I did not perform a seance and conjure up the spirit of Marie Antoinette. There was no warping of time or traveling through dimensions. I simply felt a strong, inexplicable negative emotion the moment I entered the palace. The emotion was lifted, as if someone had removed the mantle of meloncholy from around my shoulders, when I walked around the Belvedere. The cloak of emotion was placed back on my shoulders when I left the Belvedere and continued my tour through the grounds of Versailles. I have no explanations for my shift in emotions, and I don't believe one is really necessary. I like to think, however, for a short time I shared emotions with a woman I have long admired. I know that heavy feeling of being "underwhelmed." You know, it's odd about the animosity towards foreign-born queens, after all, weren't most queens all across Europe foreign-born? Thanks for sharing your experience! I appreciate getting a tour through your perceptions--as who knows when I'll make it over to France myself? I know what you mean about places going hand in hand with uninvited emotions--I'm not a fiend for the paranormal, but there are certainly things we don't understand. Thanks for sharing your experiences and impressions. I, too, am a bit of obsessed with dear MA. Can't wait to go to Versailles, retrace her steps, etc. Read so many books about her too! But what I really want to add is that a certain type of psychic ability has to do with places and objects - being able to sense an object's historical use or meaning, being able to feel the emotions that were prevalent in a place or location. For example, as a child of 10 our family went to Mission San Juan Bautista in Gilroy, CA. I was overwhelmed with anguished sadness, and kept "seeing" scenes of tormented, ill, "Catholic" Native Americans. I was depressed and in a kind of fog for weeks afterward. I later found out these types of scenes had actually taken place. So your commments on experiencing Versailles made absolute sense to me. Question: Is is true you can still catch the whiff of talc and dog poo in the Hall of Mirrors? (I read that somewhere). Also, did you enjoy the visual and sensual beauty of Sophia Coppola's movie? I did, although in many ways the movie was lacking. But it very much gave me the feeling of being there during that time. When you were in Paris did you track down those amazing pastries and macaroons from the movie at Laduree???? Thanks again for your writings!